It has been so long since I started writing up this recipe from my brother’s engagement party that he is now married. Inexcusable, no? Anyway, we – and by “we” I mean “The Chef” – made a huge batch of this recipe for a St. Patrick’s Day engagement party and served it up in shot glasses. In my world, Soup + Shots + Bacon = Phenom. Seriously – peas are usually beyond lame, but the toppings on this make it delectable. This is actually Daniel Boulud‘s super schmancy pea soup recipe, but it has been classed-down by Food & Wine for an easier preparation. It’s served cold so it’s a cinch for a party. Make a bunch and sip all summer. In a medium soup pot, cook the bacon over moderate heat until browned and crisp, about 6 minutes. Transfer the bacon to a plate; reserve the fat in a bowl in case you need to add it at the end for more bacon flavor. In the same pot, heat the olive oil. Add the celery, onion and leek and cook over moderately low heat, stirring occasionally, until softened but not browned, about 7 minutes. Add the chicken stock, 4 slices of the cooked bacon, 1 rosemary sprig and a pinch each of salt and white pepper. Simmer until the vegetables are very tender, about 15 minutes. Discard the bacon and rosemary. Using a slotted spoon, transfer the vegetables to a blender. Meanwhile, bring a medium saucepan of salted water to a boil. Add the sugar snaps and cook for 3 minutes. Add the frozen baby peas and the parsley and cook just until heated through, about 1 minute; drain. Add the sugar snaps, baby peas and parsley to the blender and puree until smooth, adding a few tablespoons of the broth to loosen the mixture. Transfer the soup and the remaining broth to a large bowl set in a larger bowl of ice water to cool. In a small saucepan, bring the heavy cream, garlic and remaining rosemary sprig to a boil. Simmer over low heat until slightly reduced, about 5 minutes. Strain the garlic cream into a bowl and let cool. 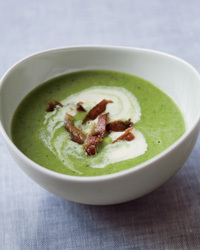 Ladle the chilled pea soup into bowls and drizzle with the garlic cream. (Use a squirt bottle to make pretty designs out of the cream. It’s absurdly cheffy, but so freaking fun.) Crumble the remaining 4 slices of bacon into each bowl and serve.